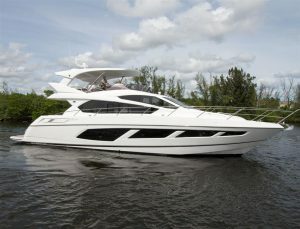 Price reduced on this 65' Sunseeker 2017 yacht for sale in Florida! : Atlantic Yacht & Ship, Inc.
Price reduced on this beautiful 65′ Sunseeker 2017 yacht for sale in Florida! Are you in the market for a 65′ Sunseeker 2017 yacht? Then be sure to check out this used 65′ Sunseeker 2017 for sale with Stephen Faraldo! In the first place, this boat is better than new and right in your back yard! Moreover, professionally maintained by her captain and crew she shows like new. Of course, this 65′ Sunseeker 2017 comes will full factory warranty. Overall she is luxury and versatility combined with superior craftsmanship. Along with her factory warranties, she is loaded with options and upgrades! As can be seen, this used 65′ Sunseeker 2017 is powered by twin MAN diesel engines. In fact, with 1,200 horse power each this yacht will cruise in the mid 20 knot range. Furthermore, with her hard-top and bow & stern thrusters you know she is fully-loaded. In fact, she also has a Sleipner SPS 55 hull stabilizer system. These include the Vector Fin 0.8 meter upgrades that provide superior stability. And that is just the overview! For more information on this used 65′ Sunseeker 2017 be sure to contact Stephen Faraldo today! Trades accepted on this beautiful 2017 used 75′ Sunseeker yacht for sale! Trades accepted on this beautiful 2017 75′ Sunseeker yacht for sale! $200k price reduction announced on this sleek used 65′ Sunseeker 2017!